A strange lake in British Columbia, Canada, which is believed by locals to have healing properties has been found to have conditions similar to that of Mars. The micro organic life found in this lake could be the type of life that could exist on Mars..
For example, one pool might help with someone suffering with warts, while another pool would be more helpful for body aches and joint pain. But perhaps more impressively, the lake contains the highest concentration of sulphates seen anywhere on the planet. Experts said: “Analysis of water from Spotted Lake reveals that organisms are indeed living in the pools. The lake is unique in that it has no outflow. There are no streams running in or out of the water. 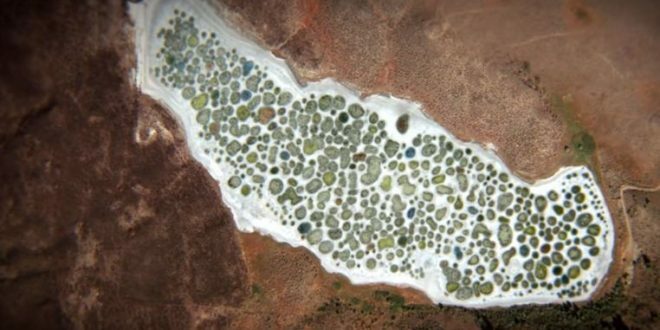 Collections of saline and brine have pooled together in different quantities throughout the lake, leaving the phenomenon of the strange circles that can be clearly seen from an aerial view. Except this lake is sheltered by a thick atmosphere, isn’t frozen, is protected by the ozone layer and magnetosphere, AND has ongoing large quantities of carbon and water exchange.